It seems to happen every few years. 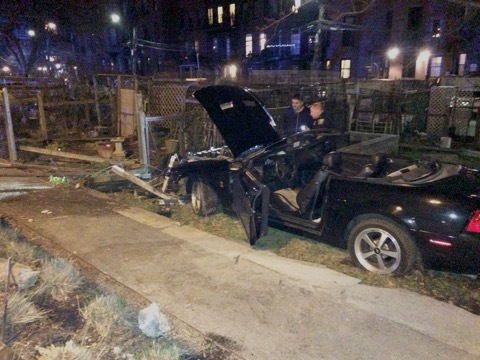 On the night of Sunday, April 12th, a car crashed into our garden. The car, driving erratically down East Berkeley Street, swerved to the left and headed toward the garden. After launching off the curb, the car sailed through the fence, taking out 2 fence panels and their concrete foundations. While sailing through the fence, the car also managed to spin around 180 degrees and land in the garden central grass area facing the 'wrong way'. The car hit around the middle of the garden, so only the corner of 1 garden plot was damaged. In landing in the central area the car managed to take out our the water system. Luckily, the water was not yet on, so we did not have a geyser in addition to the car in the garden. 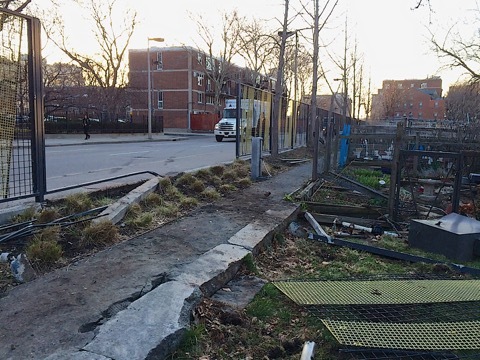 But because of the damage, water for gardeners can't be restored until the system gets repaired. No one was injured in the crash, but one gardener was heading towards that area, and missed being in the wrong place by about a minute. The driver was not injured, and there were no pedestrians on that sidewalk at the time (fortunately, given it was an early evening crash). While there were no injuries, the garden damage was extensive. The water system was damaged below ground, so the concrete pad has to be removed and the entire area excavated in order to repair the damage and replace all the hardware. The fence panels will take a few months to re-fabricate. If you wish to donate to the garden, please make cheques out to BNAN/TToR, and write "Berkeley Garden" in the memo field. Please indicate if you would like a receipt for your donation for tax purposes. For additional photos of the accident, please see John McLachlan's Flickr photo album. The photos may be used for press purposes, as long as credit is given. We thank everyone for the well wishes we have received, and hope to have the garden repairs as fast as we can.